Today is the Moscow Day celebration. Fairs and concerts are being held all over the capital. An art exhibition entitled "Creative Works By Alexandr Pushkin and Mikhail Bulgakov in Drawings by Nadya Rusheva" opened today at Pushkin's gallery flat. The exhibition contains hundreds of drawings by the promising young artist who died at the age of 16. Present at the exhibition were Natalia Daidalovna Azhykmaa-Rusheva, one of the first Tuvan ballet-dancers, mother of the artist, the Moscow public, and Tuvan diaspora. Albert Kuvezin continues to experiment. The leader of the folk-rock group Yat-Kha decided that the group should give a concert in one of the Moscow nightclubs-- fresh from the Moscow Airport. Yat-Kha has just completed the second stage of work on their new album in Great Britain, and upon arrival in Moscow will head directly to "16 Tons" (Presnenski Val, 6) nightclub and play for their many Moscow fans and countrymen. The performance will begin at 11:00 PM--just two hours after their British Airlines flight lands in Sheremetievo. As Europe is drowning, Tuva is on fire. To date there have been over forty forest fires that have covered over 3,353 hectars (8,285 acres) of Tuva. Luckily the last two days of heavy rain has extinguished most of the fires. One hundred twenty-two 'fire-jumpers' invited to Tuva from neighboring regions are standing by to fight more fires, should the coming hot weather re-ignite them. The tennis tournament annually held in Tuva's capital, Kyzyl, has this year attracted some of the best players from Siberia. This year, it was held in auspice of the Prime-Minister so the purse was bigger. While young Tuvan tennis players compete almost equally with competitors from Irkutsk, Krasnoyarsk, and Abakan, the adult players have not presented quite the same challenge to their foreign competitors. Among the girls the winner is Aldynai Davaa (Tuva), the women, Larisa Kovalenko (Tuva), the boys, Artur Udumbara, and the men, Pavel Sikanov (Krasnoyarsk). The newspaper, "Risk-Inform" (editor-in-chief is Sergei Gorev) has set up a site online (www.risk-inform.boom.ru), making it the third Tuvan media group to have an internet version--the other two being the information agency Tuva-Online (http://online.tuva.ru), and "Centre of Asia" (www.centreasia.dem.ru). The name "Risk-Inform" is very indicative of its subject matter, which is usually on the edge of decency and criticizes people in power. The Risk-Inform premises has been attempted to be set on fire in the past--it is thought that people who have been insulted in the paper could be to blame. The 12th Forum of Russian Entomology is being held in St. Petersburg. Scientists who have devoted their lives to the study of insects are meeting to discuss their problems and exchange the results of their research. 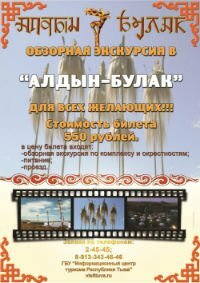 Valentin Zaika, who lectures at the Tuvan State University, and his former student, Alexandr Saaya, are now colleagues and are presenting "Tipuloid insects of Tuva" at the forum. Their report arouses special interest because Tuvas unique geographic position has proven to be a center for the formation of many species of insects. Anna Mongush is Tuvan Dangyna! The annual beauty contest took place in the Drama Theater. "Dangyna 2002" was the title of the pageant and takes its name from a character in Tuvan fairy-tales. The new 'princess' of Tuva is Anna Mongush, a 17 year-old school girl from Kyzyl. Her runner-up is Aziana Stepanova from Kyzyl-Mazhalyk (Baryyn-Khemchik kozhuun). Today a public meeting of the children and grandchildren of the repressed people took place at the 'Monument to the Repressed Arat'or Tuvan peasant (Krasnykh Partisan Str. 7). The relatives of all those who perished during the years of repression get together annually to remember the innocent victims of the regime. Today was 'khuresh' day--it's considered to be the climax of the national festival. Khuresh Stadium, where the main wrestling competition takes place, was overcrowded. There was little hope that there would be a tense fight for 1st place, as Ayas Mongush has proven to be invincible for the last 10 years.